What is the course all about? The Certified Scrum Developer or CSD technical track certification in Riyadh helps a professional acquire a thorough understanding of Scrum principles. Enabling aspirants to establish standards and best practices, this course aids in a swift creation of quality software, sparing iterations. Broken up into 2 parts, the first segment allows aspirants to learn about Scrum framework and its principles along with the working in the Scrum environment. The 2nd part thrusts majorly on the CSD technical Track training which is a combination of practical and theory sessions supported by code samples. The course makes you an expert in areas and methodologies related to Scrum and Agile Engineering and Scrum lifecycle. 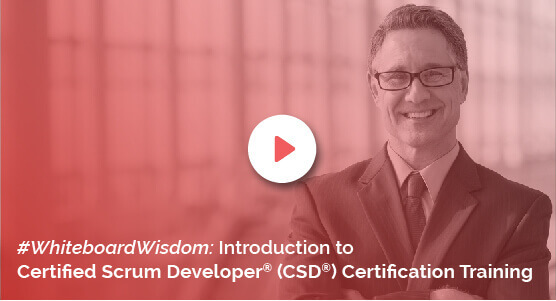 Benefits of the course The KnowledgeHut online academy is duly authorized by Scrum for providing the CSD technical track certification in Riyadh. Offering a Scrum Developer Certificate, participants can also benefit from put into place befitting design alternatives in the Scrum environment through the technical expertise of trainers. Getting CSD technical track training and Agile management skills through KnowledgeHut thus can bring out the best of self-learning through the intervention of proficient instructors. The KnowledgeHut Way CSD technical track certification cost is quite low and you get the scrum authorized trainer, study material, practice sessions, tutors and basic lectures at very affordable cost. CSD technical track certification in Riyadh is of only 5 days duration, and you can attain it by learning at your free time.